The Sin Bin Sports Blog: Could The Canucks Be Rushing Daniel Sedin Back? Could The Canucks Be Rushing Daniel Sedin Back? Vancouver Canucks fans have had little to cheer for. Their team is in a 3-0 series hole and on the brink of elimination, however they may have found their first reason to cheer. No they are not cheering for the latest near perfect dive one of their Canucks pulls off, but because Daniel Sedin will be joining and skating with the team before game four on Wednesday. "That won't be my decision," Vigneault said. "That's a medical decision. He's been skating now for a quite a few days. They feel that he's progressed real well and he's cleared to practice with the team. We'll have a better indication here in the next couple days." Sedin has not played in a game since he suffered a concussion on March 21, after being elbowed in the head by Duncan Keith of the Chicago Blackhawks. 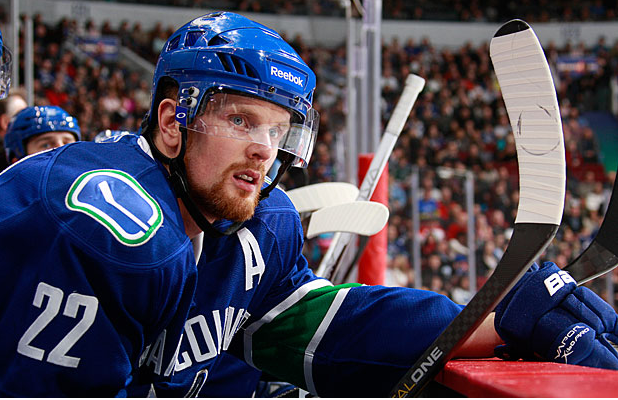 Could the Canucks be rushing Sedin back into the line-up in order to try and claw themselves back into the series? Lets hope not. I mean, my feeling towards the Canucks are not the best, and I have enjoyed every second of the Kings taking it to the Canucks this series, but bringing Sedin back before he is ready would only hurt the Canucks in the long run. Sedin was said to be progressing and possibly be ready for a return before game one of the series, but suffered a setback at one of his first full practices back with the team. If he in fact is ready this time and returns, it will undoubtedly give the Canucks some much needed jump. If he is not ready, and the Canucks look the other way it will do two things. It will pretty much move the Canucks into full panic mode, and could ultimately hurt Sedin and hinder the rest of his career. If I was Vigneault, and Dustin Brown was dropping players with the last name Sedin like he did in the video below, I definitely wouldn't chance it.